Its a Heat Wave! /Hawks Aloft Inc. 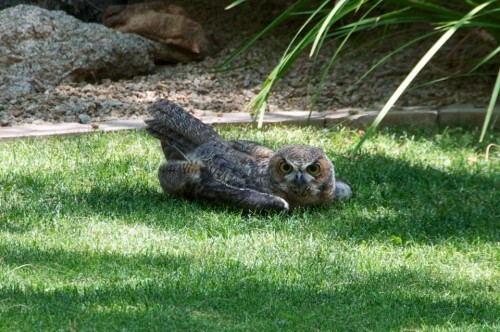 This little fellow showed up laying in the shade on a damp lawn one day, in the back yard of Rich M., a Phoenix resident. It’s HOT there! Through a friend, he contacted Chellye Porter, worried about the health of this recently fledged owlet. So, Chellye called us. Our thoughts ran to HEAT stress. We suggested that the owlet might just be trying to keep cool. Sure enough, every night the little fellow disappeared only to show up again in the rising heat the next day. This went on for about 10 days and then the owlet moved on, apparently not in need of the cooling properties of shade and grass. He has been seen roosting in a tree in the neighborhood, and occasionally returns to the cool grass. Thanks to Chellye for sharing the story and to Rich M. for the image. Clever owlet!